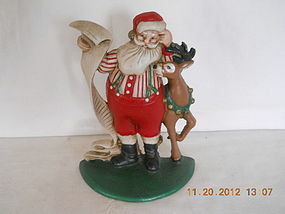 This Santa has so much the joyful face we all know with his favorite reindeer at his side. Perfectly hand painted under glaze then antiquated. Midwest is responsible for this wonder. In excellent condition, he measures 8 ½ “ and weighs 3 ½ “.